The hosts file is a file on your computer, used to map hostnames to IP addresses. With the hosts file you can change the IP to which you resolve a certain domain name. This is particularly useful when you wish to see how a website will look when hosted on a different server without having to wait for a DNS change to propagate, or avoiding any DNS changes at all. You can use any text editor you like, such as Notepad, to edit the hosts file. 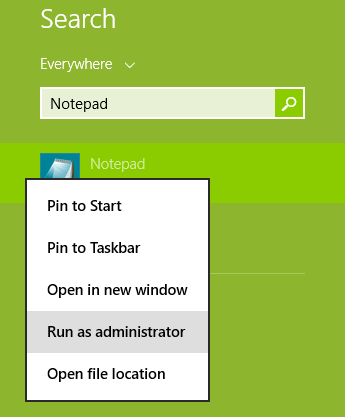 However the editor must be run as administrator, by right clicking the corresponding icon and selecting Run as administrator. Right click on the hosts file and click Properties. Switch to the Security tab and click on the Advanced button. Navigate to the Owner tab and click Edit. Highlight your user account or the Administrators group and click OK twice to quit the Advanced Security Settings dialog box. On the Security tab under the Properties dialog box click Edit. Highlight the Administrators group, check the box for Full control under Allow and click OK.
You will be prompted to enter your password to run the command above as root. The hosts file contains lines of text consisting of an IP address in the first text field followed by one or more hostnames. Each field is separated by white space. Save the hosts file when done. The hostname yourdomain.com should be mapped to the IP address 1.2.3.4.